So, you want to know how to start a food blog, but you’re stuck. Where to start? It’s confusing when you don’t know the ins and outs of all the technical aspects of blogging. We’d all rather be whipping up a batch of cookies but to start that food blog (or any blog for that matter) you’ve got to buckle down, research and learn. Take it from a professional blogger, learn from those with years of experience instead of trying to figure it all out on your own. It is well worth it if you want to learn how to become a successful blogger. DIY baby! 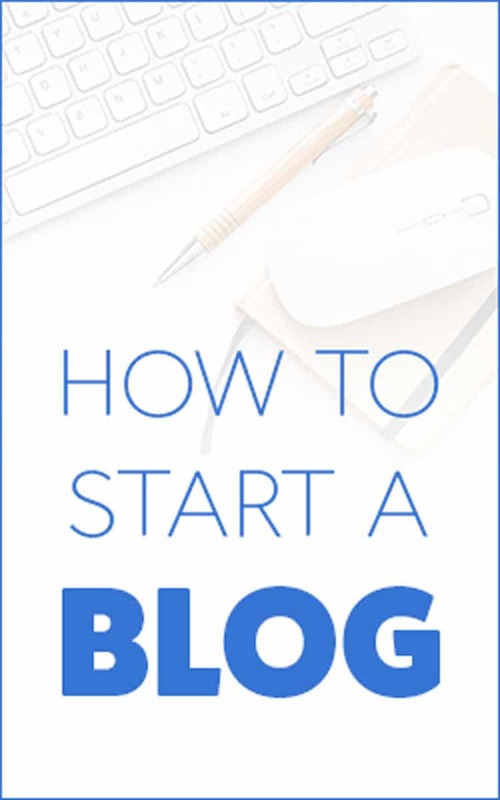 Learning how to start a blog to make money is easier than you might think, and with a small amount of time invested, you can set up your self-hosted WordPress website with the details provided below. It’s affordable, costing as little as $3.95 per month in hosting and on the cost of a theme (there are so many to choose from ranging in price from free to around $130). I built this site myself using the tools provided below to set up my blog when I first started. You can do it too! I know you can! Please note that this page contains affiliate links. All products I link to are those that I have used myself and enthusiastically recommend to new bloggers. Thank you for your support. Here are the basic steps to set up a self-hosted WordPress food blog that is both beautiful and functional. Your blog will have your domain name and your distinct look, and it will be able to scale with you as your blog grows. When you’re starting a food blog, I recommend following these steps for a greater shot at success. 1) Time to name your blog and buy a domain name. Before you buy your domain name, check to see if the name is available across social media too. Find a domain name that is short and sweet. You want a memorable name, and if at all possible for it to end in .com since that is the most well known. (blogname.com). You might also want to take the time to do some keyword research with Jaaxy. Ranking in Google is essential if you want people to find your blog organically. One of the best ways to have a blog that is highly rated blog by the search engines is to have a keyword that a lot of people search for, but that does not have a lot of competition somewhere in your domain name. In my opinion, Jaaxy is the only keyword research tool worth having. I’ve been using it for over a year now, and my search engine traffic continues to go up. Domain Name Cost: free with Bluehost when you use their web-hosting services. Use the domain name checking tool from Bluehost to find a domain that is available. Domain names can go fast, so buy it fast. After you have found your domain name, you can get it for free with your BlueHost hosting plan. Buy it now, because it might be gone tomorrow. 2) Sign up for the best web hosting for WordPress. The purpose of a web host is simple. You want to find the best web hosting service available. They store your website and make it available on the internet. Your website lives on the host’s servers and not on your computer. Cost: Beginning at $3.95 per month and up depending on the size of the website and amount of traffic. I highly recommend Bluehost for beginners because it is easy to use and for that reason alone it is the perfect place to start. Bluehost offers an affordable shared hosting plan that includes one-click WordPress installation, which makes it hassle free. Bluehost: Bluehost offers affordable and reliable service, and it is easy to set up. Their 24/7 customer support is available online and via phone. 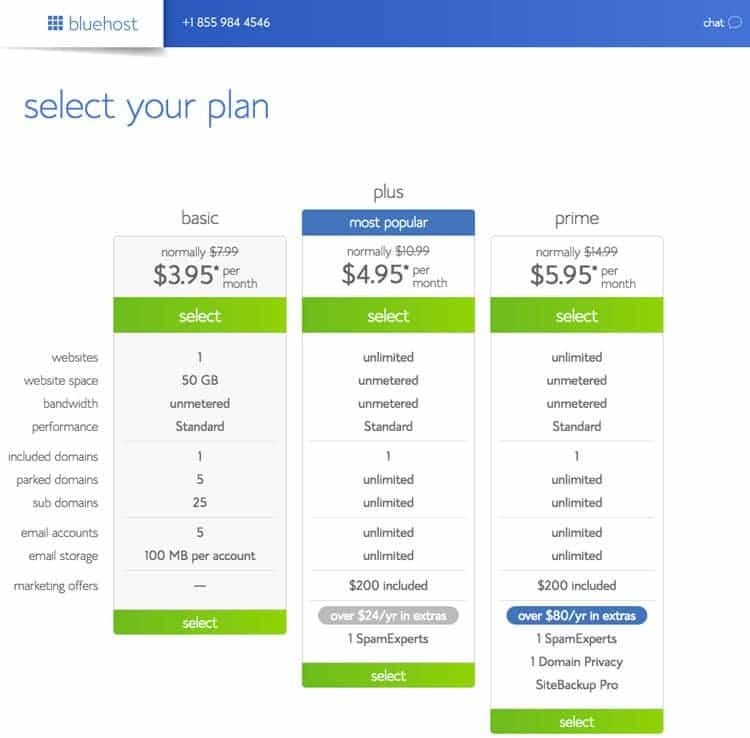 Bluehost’s “starter” plan is about as cheap as hosting gets. Click here to sign up with BlueHost for as low as $3.95 per month and get a free domain name when you do their annual plan! 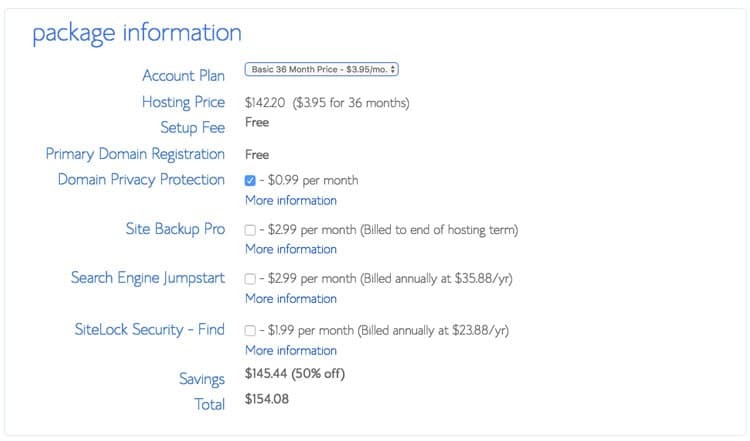 Remember, with Bluehost; you pay for your plan upfront for the year—or for longer. However, if you decide to cancel for any reason, they will refund the difference. A great thing about this is that since you pay upfront, you won’t have to budget monthly for that fee. WP Engine- WP is a nice step up from Bluehost. It is more expensive, but you also get more personalized service. I used them for a blog that I acquired and had a wonderful experience. Their customer service was top notch, and I never experienced any downtime. They have affordable monthly packages for bloggers who are just starting out. Not only do they have great service, but you can Sign up for the WP Engine affiliate program and receive a minimum of $200 per referral that signs up! If you want to earn an affiliate income, WP Engine is a great place to start. 3) Download WordPress and install on your blog. In my opinion, WordPress is the only choice for blogging software. It is user-friendly and has amazing functionality. Look to your web host for instructions on how to install WordPress. They should have documentation on their website that shows you step by step how to install WordPress. If you can’t find this information, a quick email or online chat with a tech person will get you the information you need. After you download and install WordPress, you’ll want to set up your Permalink Settings, which is used to create your URLs. We recommend setting your permalink structure to “Post name.” Make sure you save the settings. 4) Install a WordPress theme—I prefer the Genesis platform from StudioPress. The WordPress theme you choose will determine the functionality of your website, as well as the format. Cost: free themes are available, but I have always preferred the Genesis platform, which is $129. It is a worthwhile investment in your business. My blog uses the Genesis Framework by Studiopress. I also have the Foodie Pro child theme, which works together with the Genesis Framework to create the style of the website. Genesis themes are functional and beautiful. All of the newer Genesis themes are responsive, which means that they will work on any size screen from the desktop, to tablet, to a smartphone. Check out Studiopress themes, available for a one-time fee of $59.95 and up. Foodie Pro Theme is the best Studiopress theme for food bloggers. It was designed precisely for food blogs and has so many built in features that buying it is a no-brainer. Seeing how impressive it looked on fellow food blogs made me make the easy decision to invest on it myself. The built-in recipe page template is a benefit that will easily help drive keep traffic on your site. Check out Foodie Pro Theme, available for a one-time fee of $74.95. 5) Set up Google Analytics, Feedburner and Webmaster Tools. Google Analytics is essential to see details regarding traffic. Analytics provide you with demographics of who and where your audience is, in addition to the basic information showing what blog posts your traffic is going to and how many people are visiting your blog. Webmaster Tools is where you will submit your site to Google search engine to make sure it starts to show up in search results. There are many other things you can do from Webmaster Tools as well. 6) Set up social media accounts if you didn’t do this when you decided on your domain name. You will want to be on Facebook, Twitter, Pinterest, and Instagram to start. Youtube is also beneficial depending on your niche and your comfort level with video. Cost: free to sign up! Eventually, you might incur some cost if you decide to promote posts or use one of the social media services that we highly recommend. WordPress plugins extend the functionality of WordPress in certain areas. For example, one of my recommended WordPress plugins helps prevent spam comments. 8) Create and publish! No matter what your niche is, whether you are a food blogger, lifestyle blogger, parenting or travel blogger—being consistent in the frequency of your posts is so important. Create captivating stories to share with your audience and write like you already have an audience. It’s so much easier to get a post right from the get-go than it is to go back through hundreds of posts and update old content. Good photos, attractive format, and interlinking to other posts on your blog from the beginning are very important. If you’re considering affiliate marketing, this is a good time to sign up for some affiliate networks and start putting 1-2 links to relevant products or services in each post, in an organic manner. DSLR Camera- I use a Canon EOS and LOVE it. Along with that, I use a simple Canon EF 50mm lens for most of my food photo shoots. Food photography props. I am constantly looking at the sales at Target, Anthropologie, and World Market–not to mention thrift stores and garage sales. Alternate lighting and photo studio shooting tent for those gloomy days–something that happens on a regular basis in the winter months here in the Midwest. Portable table or workspace with the natural lighting. If you don’t have space dedicated to your food photography, having a portable table is a must. Jaaxy – Ranking in Google is essential if you want people or organically find your blog. Add in affiliate marketing with relevant keywords that target consumers, AND you’ve got a winning combination. In my opinion, Jaaxy is the only keyword research tool worth having. It is worth its weight in gold. Use it when creating every post, and it will show you what its value is. Face it, if you want to learn how to start a blog to make money, keyword research is essential. Tailwind App – Used for scheduling posts on Pinterest and Instagram. Once you’ve been on Pinterest and joined some group boards, you will want this tool so you can easily spread your pins out and schedule them in advance. PostPlanner – This Facebook scheduling tool allows you to schedule all your posts and content from other websites/Facebook pages as well. It allows you to obtain consistency without being logged into social media 24/7, which in turn helps to build a bigger following. Adobe PhotoShop and Lightroom – Edit photos to use on your website. Adobe Photo Stock – Buy stock photos to use on your website. Affiliate Marketing Classes Business Bundle– I recommend Pajama Affiliates hands down. They provide easy to follow instruction and are results-oriented. The women who run the program are affiliate marketing bloggers themselves and have proven results using their methods. Working With Brands- I highly recommend Jenny Melrose’s course. You won’t be disappointed. If you’re a beginner interested in working with brands, this is a great place to get your feet wet and learn while your blog grows so that you’re ready to dive in and swim with the big fish when the time is right. Questions? Ask a question in the comments section, and I’ll answer each and every one of them. I’m here to help you navigate your foray into blogging.